The party has outlined a set of radical political reforms which will have little chance of being implemented by the current government. 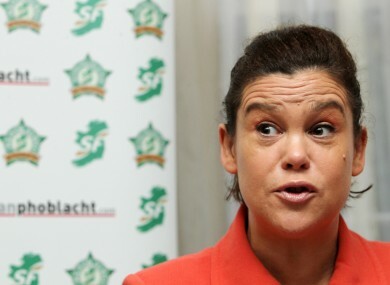 Mary Lou McDonald at the launch of Sinn Féin's political reform proposals today. SINN FÉIN HAS PROPOSED using citizens’ PPS numbers to automatically put them on the electoral register when they are eligible to vote as well as create larger, seven-seat Dáil constituencies. The party has launched a set of political reform proposals which would see an independent electoral commission establish, as well as lower the voting age to 16 and introducing gender quotas of 30 per cent rising to 50 per cent – a measure already implemented by government. Another proposal would see a partial list system introduced for Dáil elections to ensure representation for women and other under-represented groups. A third of the Dáil would be elected through a list system while two-thirds would be elected in large seven-seat constituencies on the current proportional representation method to “ensure that the results reflect more accurately actual voter preference”. Other changes include more representation and time devoted to Northern Ireland, with a proposal to allow Northern MPs immediate speaking time and consultative rights in the Dáil. The party is also proposing to change the Constitution to allow northern MPs to automatically become members of the Dáil. Speaking today, the party’s whip Aengus Ó Snodaigh denied this was in a bid to give Sinn Féin MPs, who abstain from Wesminster, speaking time in another parliamentary chamber, pointing out it would be open to DUP and other party MPs. Other ideas include a secret ballot of TDs for the appointment of a Ceann Comhairle, a special committee for the Taoiseach, scrapping of Freedom of Information fees, and a cap on ministerial salaries of €100,000 and €75,000 for TDs. Senator David Cullinane also outlined the party’s proposals for Seanad reform including direct elections, representation for the North and minority groups and 50 per cent female representation – proposals already floated by other parties and interest groups. Email “Sinn Féin wants seven-seat Dáil constituencies and use of PPS numbers for electoral register”. Feedback on “Sinn Féin wants seven-seat Dáil constituencies and use of PPS numbers for electoral register”.